portrac is a simple GUI tool for tracking port updates. It's based on Qt and it integrates with the system tray. 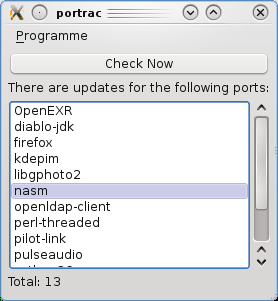 portrac shows a simple list of the available updates to the installed ports on the local machine i.e. shows the ports that have updates. It's very silent and won't bother you too much. portrac uses INDEX files to determine port updates, by default it uses http://www.FreeBSD.org/ports/INDEX-10.bz2 but every one is encouraged to use his/her closest mirror with portrac. The default check interval is 3 hours, it's recommended that you don't set it to less.